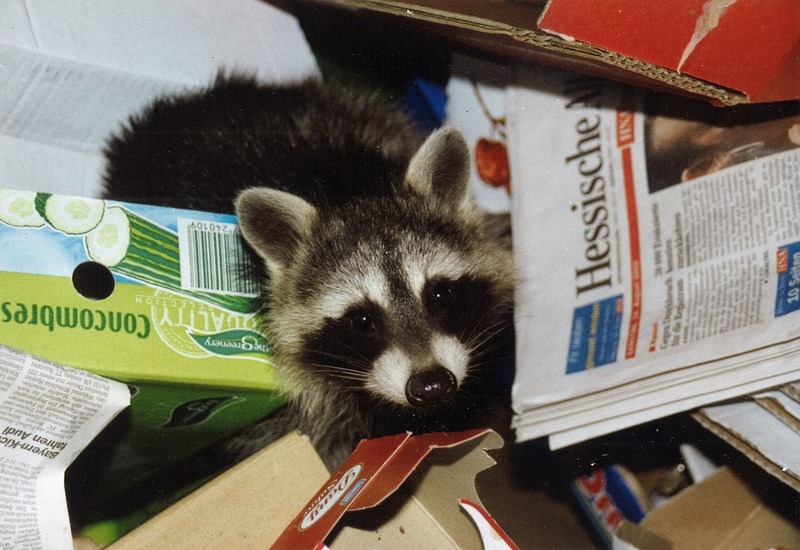 > Blog > Pest Precautions > GOOD RIDDANCE TO RACCOONS! Curious, cute & smart, Raccoons though wild animals are like us in their pursuit of happiness for food & shelter. Their ingenuity makes these nocturnal bandits a challenge to evict once they’ve found their source for “happiness” in your space. Raccoons have migrated from woodlands to urban and suburban areas where they have discovered an endless supply of food and shelter options. Do you have raccoons on your property or in your home? Here are some tips for homeowners struggling with these intelligent troublemakers and potential problems they may cause. Raccoons are nocturnal creatures and prefer to do their work in the dark. Motion activated flood lights are a good scare tactic to employ for starters as a preventative deterrent. Motion activated radios are also a great preventative. Particularly talk radio. Specifically timed or motion activated sprinklers will deter these mischievous critters by startling them with a good scare soak. 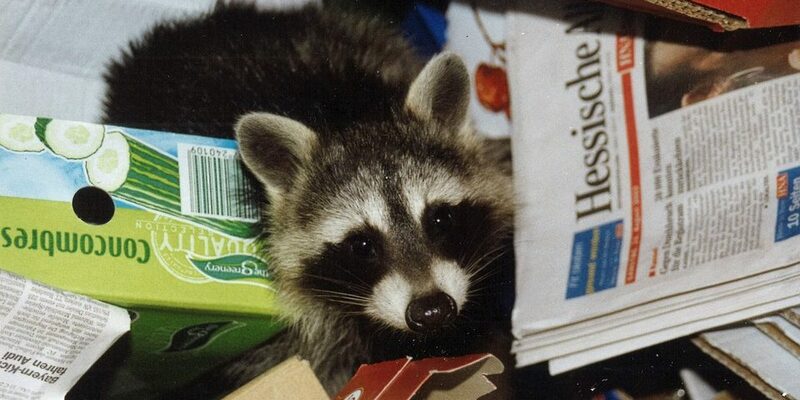 Being good climbers and excellent problem solvers, Raccoons are skilled dumpster divers. Removing or limiting access to garbage ( put garbage bins in sheds or garages) compost, garden remains, fallen fruit, pet food, bird feeders, etc. will help in limiting these opportunistic feeders supply. They will simply find an easier source to access. Raccoons like nice, dry, warm places like hollow logs, burrows, holes in trees, and dens abandoned by other animals. Being intelligent and urban opportunists they often go one step further and move into your attic? It’s warm, dry and more spacious. Good for them, bad for you. Raccoons often look for homes for their young in attics and will ruin insulation, wreck soffits and screens, and make holes in the side of your house to set up a cozy home for their families. Aside from being destructive, raccoons commonly carry fleas, roundworm, and rabies. For all of these reasons, evicting these unwanted guests is important. If there are raccoons currently living in your attic you can try the above scare tactics. Preventing easy access by trimming back all tree branches, wood piles, etc. that may be used to climb onto your roof can also be helpful. Inspect roof and soffits to locate point of entry. If no raccoons are in the attic. Patch and seal entry holes. If there are raccoons or babies then live trapping is an option. Ammonia, cayenne pepper, and moth balls are all scents that raccoons do not like. Using these scents as part of the preventative plan is often a good addition to the eviction process. Premier Pest Management is happy to provide you with these simple, DIY tips to keep your home pest free. If you’re noticing your DIY efforts are unsuccessful our home pest protection program is an excellent option to keep your home pest free year round.